Getting to the Excel London Event and Conferencing centre is a very trivial affair. While you have to make a change onto the quaintly named Docklands Light Railway, it becomes scenic, rather than underground and we were greeted by blue skies, though it was bitterly cold. Once inside the venue, its warm (thankfully), modern and only a short walk to the entrance. Like most consumer shows, ultimately it is just a big vast shed, and it’s up to the organisers, the shell scheme providers and those with their own stands to make it what it is. 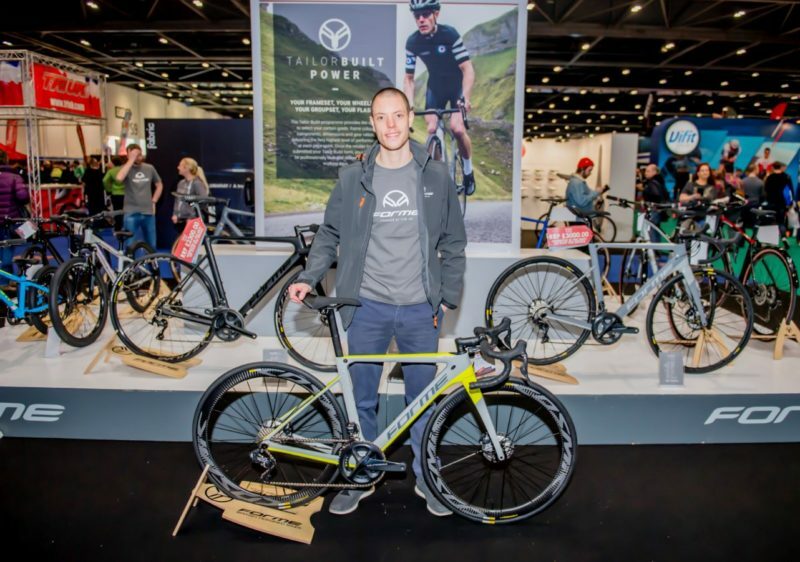 This is the London Bike Show and the Triathlon Show London at the same time, and to the keen eye, there is a clear demarcation between the Cycling elements, and those of Swim, Run and Tri paraphernalia. It does make taking in the sights from a cycle trade perspective a bit easier. And that is what we are here for, cycle trade, who’s exhibiting what, and if as a part of the trade you should be here, to exhibit or to take a look around. 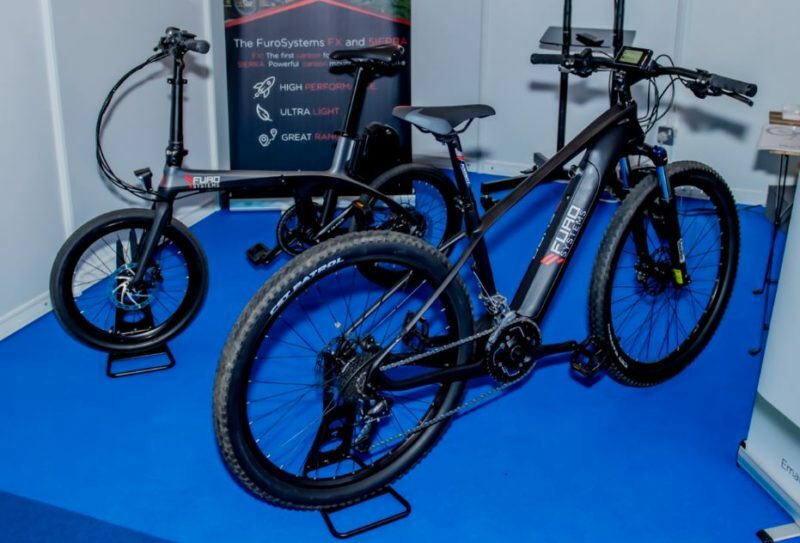 If you are London-based, or can get to London quite easily, and you did not attend Core Bike or The Bike Place in January, then this is a great event to catch up on current trends and to see what is new in the bike industry. If you went to Core or TBP, and you are not in London or the Home Counties, maybe take the weekend off. 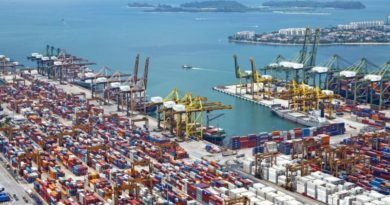 So, what was it like from a trade perspective? 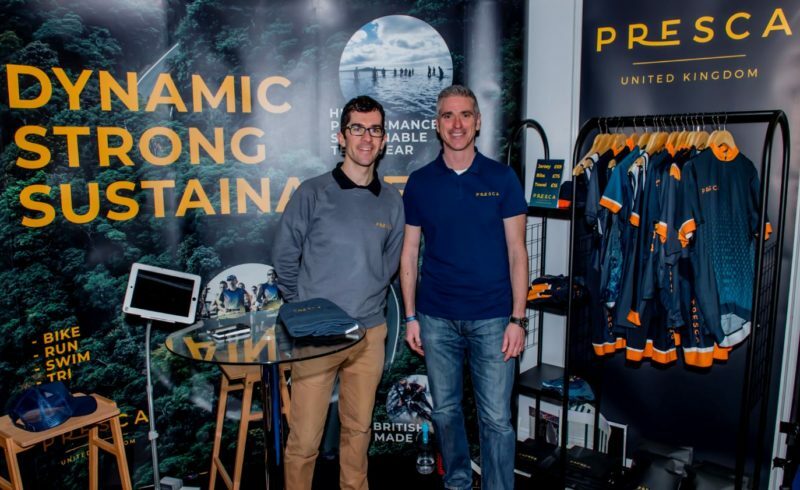 Bike shows are broadly all alike, with the same faces, products and stands, through there have been market changes in the last 6 months that mean that some familiar faces are now ‘direct’ to consumers, this means there is almost no trade ‘angle’, and are off less interest here. 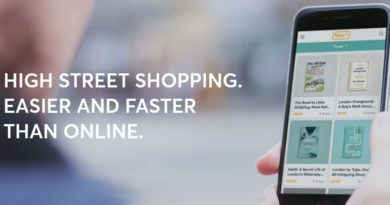 Forme is back to its best! Back at the helm of Forme, the in-house brand of Moore Large, Adam Biggs has big (sorry) plans for the brand and showing a very broad range of bikes. He’s been away from the brand for some time, learning more about his craft at Boardman Bikes and as we noted (in a December 2016 article) there is much to shout about. So much so, we plan a separate article to expand on this further. 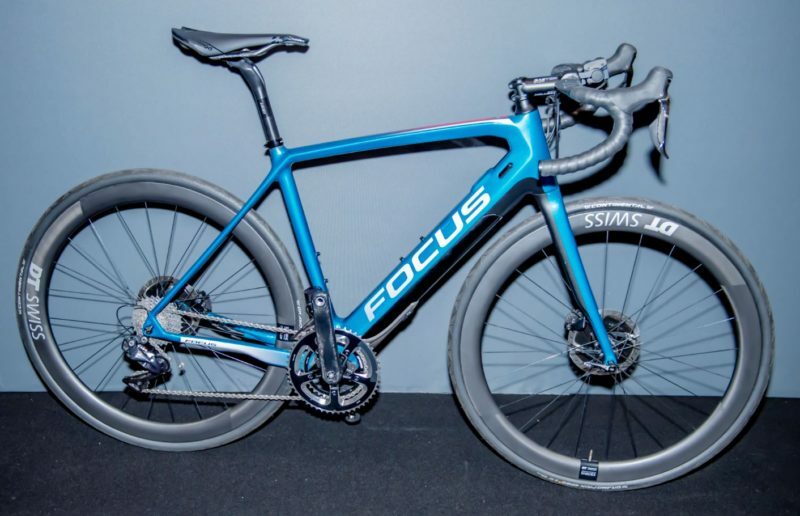 What we do know is that Forme will help consolidate the ML bike offerings, which will help support the retailer with improved products at keener prices. 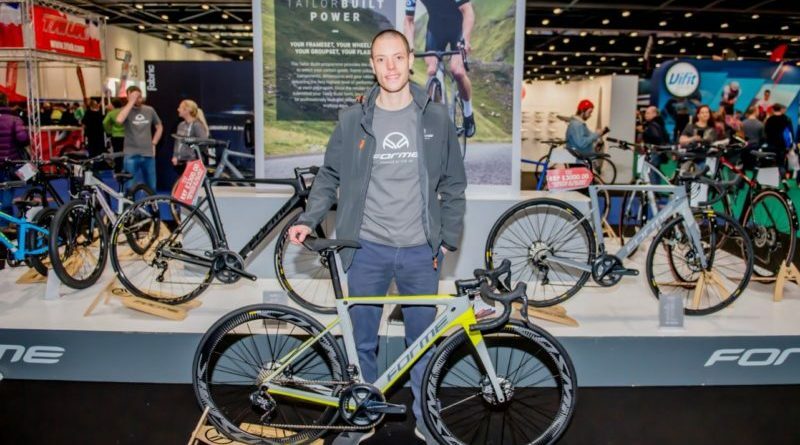 The design and quality of some of the products shown, like the Monsal Road, Calver CX and Flash SL (pictured with Adam) really tease at the products coming to retailers. ‘What’, you say. These don’t work together? It turns out that they do, collaboration is a good thing. I have known both brands for years and have used their products extensively, from bars, lights, seatposts, brake cables and disc pads, they work and are reliable. 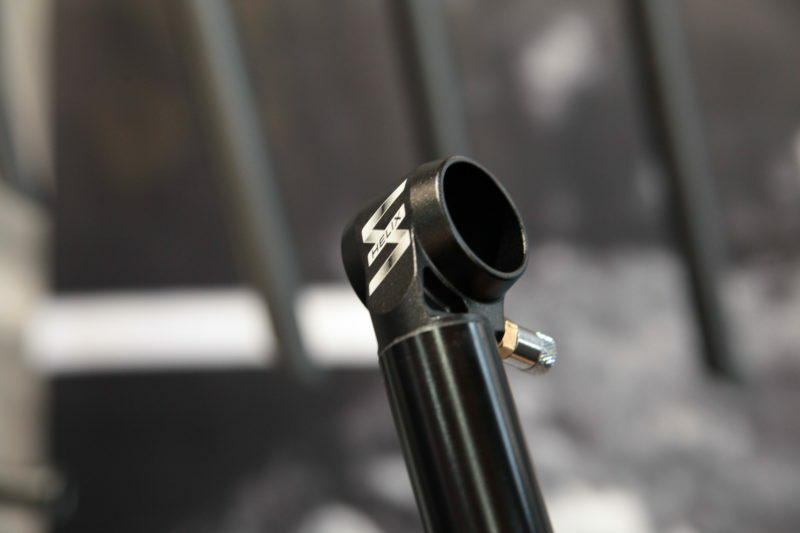 USE (now branded as Ultimate) have had plans for a dropper post on the drawing board for some time, and they were showing what is as close to finished a product without the finalised production parts. By the time you read this, the Dropper (called the Helix – due to the helical mechanics inside) will be ready and being stocked by USE. I have been on their test programme and in typical USE style, they would not settle on a final product until it was ready for market. No beta testing on real customers here! So the final product will be 35 – 50 grams lighter than pre-production, so likely to be around 350 grams, with a custom actuator and cable fitments supplied by Fibrax. I asked Mark Swift from USE about the tie in, he said that they asked several companies from within the trade to provide quotes for custom lengths, with all the fitments, ferrules and cable ends. Fibrax were able to offer the best product, light weights and pre-packaged for a very competitive price, and they made to order in the UK, part of the USE ethos. A win win, as Mark called it. Fibrax had a similar story, they knew they had a competitive lightweight offering and could make small batch orders to create initial inventory, and for the test fleet, and could supply custom sizes. Cable actuated droppers often have convoluted internal routing, and while shielded from a winters detritus, it needs to be of great quality, and fit and forget. They think they have supplied that product and USE agree. There is a lot of controversy about e-bike specific parts, e-bike saddles and e-bike grips for example. While some of these are ‘smoke and mirrors’, e-bike brakes and drive trains are put through more than your average non e-bike components. More mass to accelerate and more mass to have to stop. 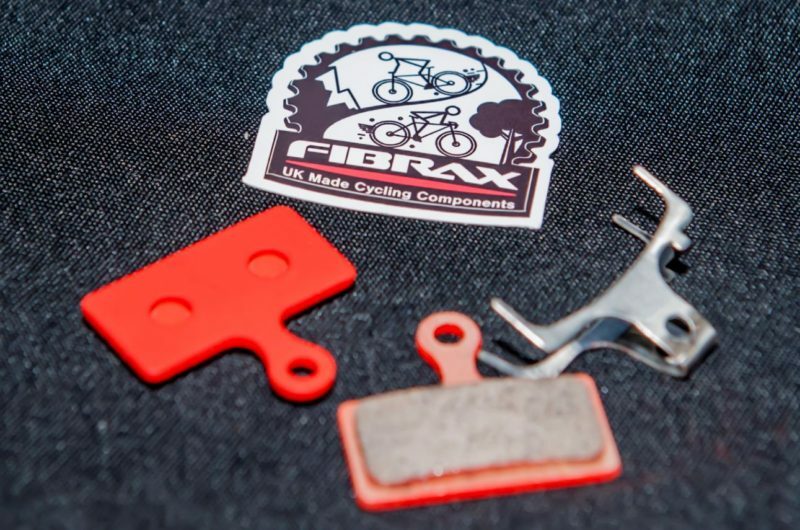 To that end, Fibrax has developed and were launching a new e-bike specific disc brake pad. What makes it e-bike specific is the use of a Metallic Sintered material with specific binder materials to prevent heat build up that can prematurely wear and glaze in high heat applications. 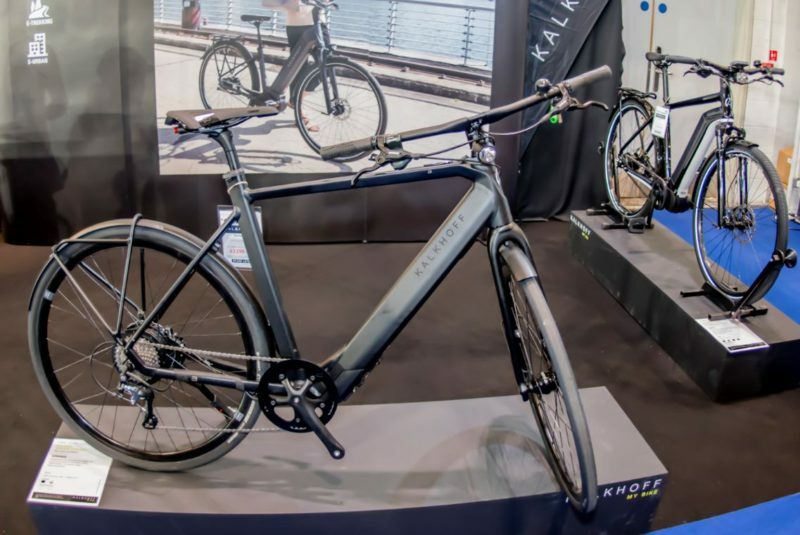 While on the subject of e-bikes, TRI UK were showing off a very interesting Road e-bike, the Project Y. This looks very much like a standard bike, partly due to the subtle paint differences, where the battery is stored is black and from many angles almost disappears. It also doesn’t appear to have (from the drive side at least) a motor. It does, of course. The Fuzua Evation motor is really only viewable from the non driver side. It is a real looker and was turning a lot of heads. Interestingly, both the front and real hub spacings are adopting the ‘Boost’ standard, which is more an MTB thing. I wonder if that will catch on in Road products? Also on the stand was a very Paul Smith inspired Izalco Max road bike and many MTB and eMTB’s. The caliper braked Izalco looking much better that the Disc version also on display. Sticking with e-bikes, the e-bike specialist (who also sell bikes, though they were not on display) were showcasing some of their products. The standout e-Bike looks scarily like a bike and this is where mainstream acceptance of e-Bike appears to be going, lower weight, less bulky looks and more bike like aesthetics. I’m talking about the Kalkhoff Berleen Advanced, integrated app for a smartphone, minimalist looks and a keen price for such a top specification. This one is part of the e-urban range. Craig from NRG4 was on hand to show the new range of Limar helmets, with the range-topping Astana team issue Air Speed proudly on show, looking svelte and feeling light (not Craig! ), along with the Xplova X5 Evo and X3 GPS computers. 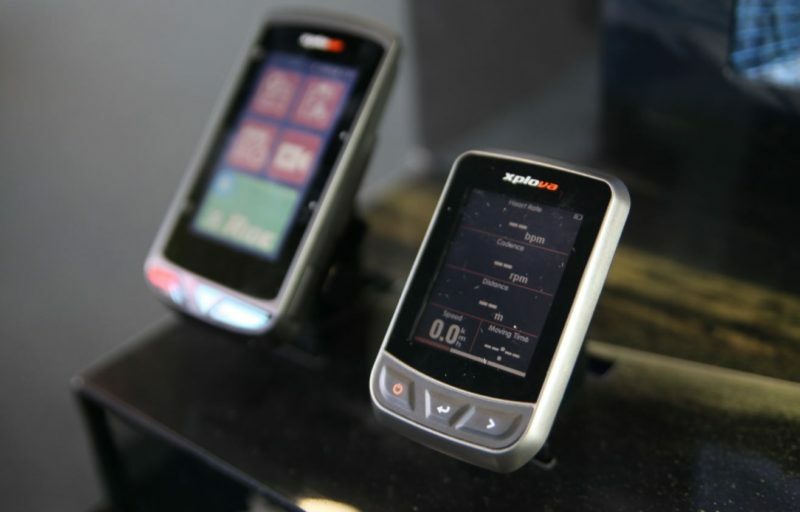 Expect big things from Xplova from what has been described as a “Garmin killer” when the reviews are in. More e-bikes? 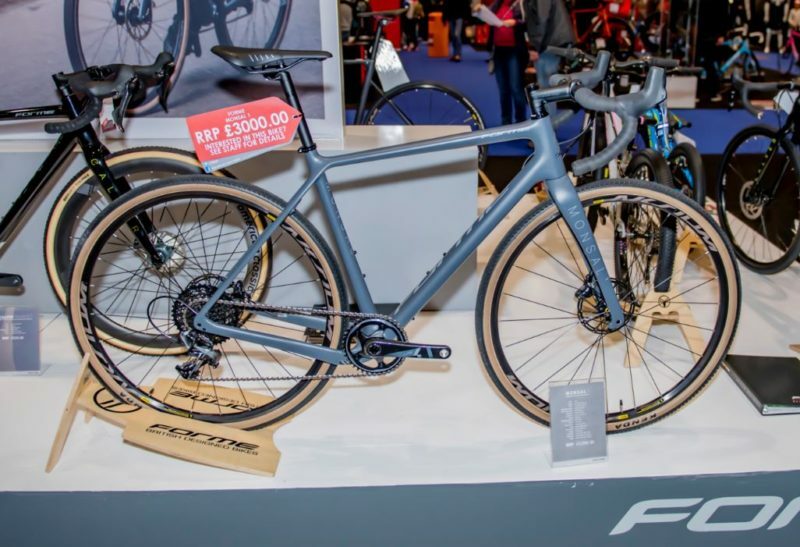 Its a wired (and sometime weird) world with both the FX Carbon Folder and the Sierra Carbon Hardtail e-MTB on display for the first time. They use rear hub and BB motors, respectively. They are currently sourcing European Dealers with stock arriving in May. The Furo FX especially looks like a great commuter bike. According to Alan and Rachel, they were inundated with customers as the event opened on the Saturday, when I saw Alan, he was not in a zone I have seen him before. The Hope Academy was in town and rather than Alan discussing the nuances of CNC manufacturing, the carbon layup facility, or which colour of anodising is most popular, he was corralling kids and their parents, so that bike riding could ensue on the most tricked out kids bikes I have ever seen. 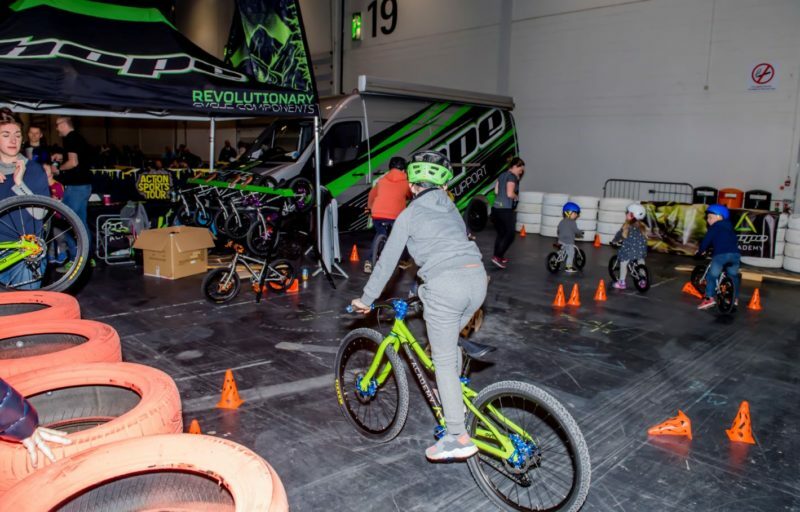 Hope were showing their full range of wares of course, but the star of the show was a mini ramp course, see saws and kids queuing up then taking to scoot bikes and mini MTBs dripping with matching anodisation. I didn’t stand a chance to get some time with Alan, didn’t want to deprive the kids who seemed to be having a great time. Oh to be a kid! 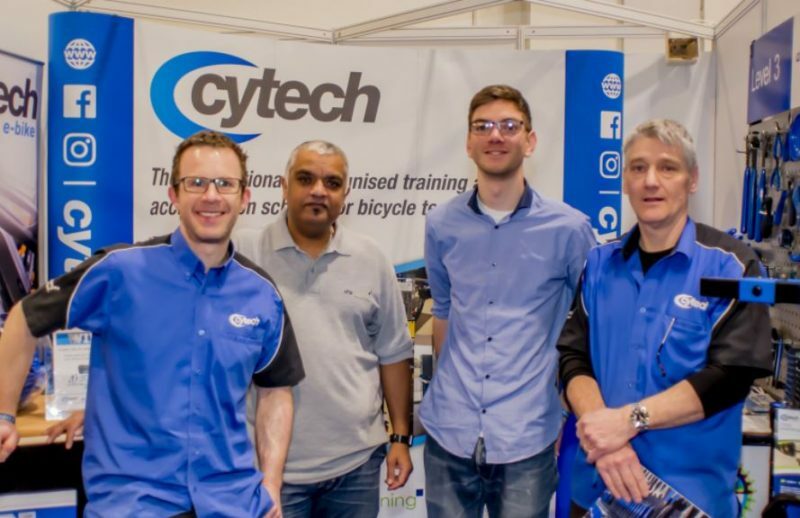 Cytech were on hand, providing information to its public-facing courses. There was a guess the number of Park Tyre levers cometic enticing people in, though there message is definitely trained, or make sure you have your bike serviced by a qualified technician. As expected, very clean benches, and every tool in the correct place! Always a big fan of the little guy branching out, Presca is a new name and launched at the show. The faces may be more familiar though, its Pete Lillie and Rob Webbon from ethical clothing brand Grn. This branching of their offering provides a custom clothing brand, as well as the more casual offerings that will remain with Grn. Some really nice kit, still made from recycled bottles. 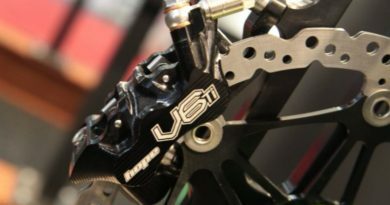 This rider-owned shop and distributor is starting to make a name for itself and has a growing portfolio of products that will grace the shelves of many a respectable shop. He was teamed up with Nox Sox / Fork Cork distributor GoneBikingMad (clever funding / sharing approach at expensive venues) to primarily promote the Smoove Lube chain lubricant, currently getting rave reviews. He was also showing a universal strap to port essentials when you are travelling light, the Louri strap is currently in black only with 3 more colours being made right now. UK made too. Returning to the shows is a brand I first saw at the NEC two years ago, offering a clever helmet with integrated speaker and bone conducting technology to help you relieve and take calls while on the move – the Linx. This is now bolstered with a new helmet, showing here for the first time, the Omni. This comes with similar voice / data technology, but now integrates rear lights and brake sensing technology to brighten (or turn on, depending upon the setting) the rear lights. Clever interaction as it also comes with an app. Brompton (through Velorution) were showing its e-bike, the Brompton Electric, which is a neat front hub motor design with a battery in a convenient backpack that mounts on a front rack. 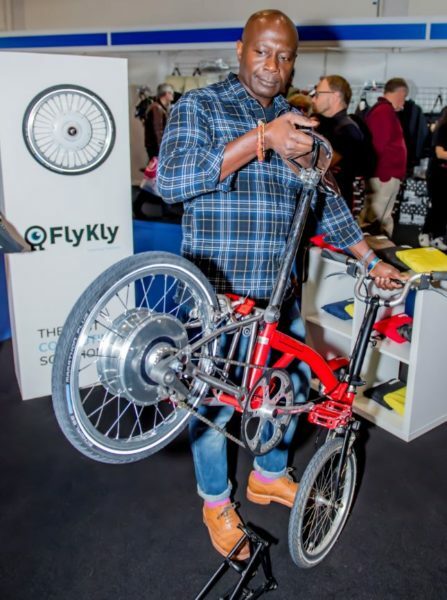 The next stand up was a company called FlyKly, demonstrating a number of technologies it distributes, including the 16”conversion kit, a smart rear frame that replaces the existing Brompton one, with hub, motor, brake and battery on one unit. With up to 40km assist and regenerative battery charging while you brake, this is a clever alternative, only adding 3 kg to the bike. 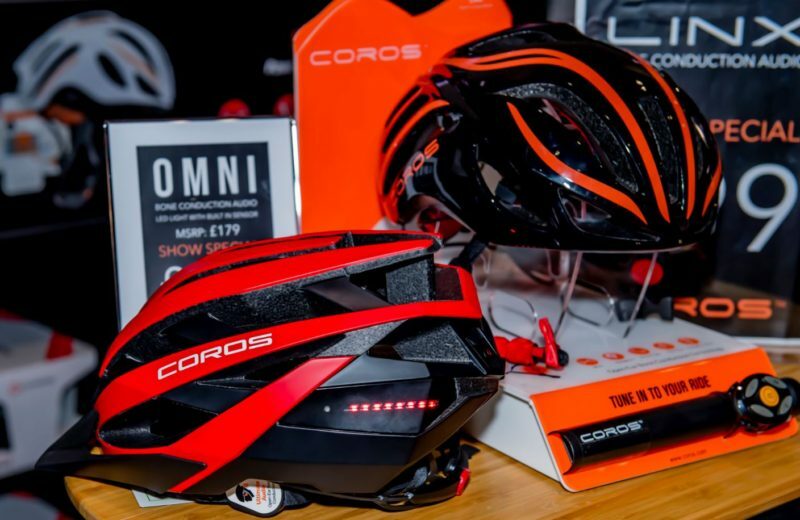 Among the other products on offer were a series of folding helmets and bottles by Closca, and a Smartphone locking D-Lock, battery powered with solar charging panels, the Lattis Ellipse. The Ellipse is currently in use on the fleet of Google shared bikes.